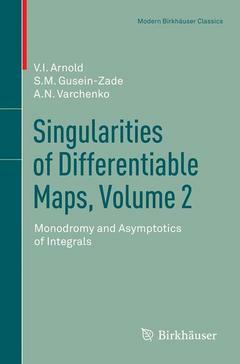 Singularities of differentiable maps, Volume 2 Arnold Elionora, Gusein-Zade S.M., Varchenko Alexander N.
Auteurs : Arnold Elionora, Gusein-Zade S.M., Varchenko Alexander N.
The present volume is the second in a two-volume set entitled Singularities of Differentiable Maps. Â While the first volume, subtitled Classification of Critical Points and originallyÂ publishedÂ as VolumeÂ 82 in the Monographs in Mathematics series, contained the zoology of differentiable maps, that is, it was devoted to a description of what, where, and how singularities could be encountered, this second volume concentrates on elements of theÂ anatomy and physiology of singularities of differentiable functions. Â The questions considered are about the structure of singularities and how they function. Part I. The topological structure of isolated critical points of functions.- Introduction.- Elements of the theory of Picard-Lefschetz.- The topology of the non-singular level set and the variation operator of a singularity.- The bifurcation sets and the monodromy group of a singularity.- The intersection matrices of singularities of functions of two variables.- The intersection forms of boundary singularities and the topology of complete intersections.- Part II. Oscillatory integrals.- Discussion of results.- Elementary integrals and the resolution of singularities of the phase.- Asymptotics and Newton polyhedra.- The singular index, examples.- Part III. Integrals of holomorphic forms over vanishing cycles.- The simplest properties of the integrals.- Complex oscillatory integrals.- Integrals and differential equations.- The coefficients of series expansions of integrals, the weighted and Hodge filtrations and the spectrum of a critical point.- The mixed Hodge structure of an isolated critical point of a holomorphic function.- The period map and the intersection form.- References.- Subject Index.